3 bits of advice to women, especially in India, on starting their own responsible tourism business. Anna, you started your career in marketing, sales and product management of consumer products. When did you discover your passion for sustainability and travel? What got you interested in sustainable tourism? When I was 30, I had a deep crisis in my life. 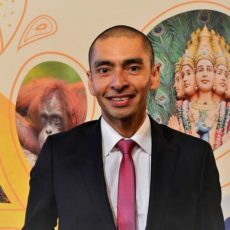 I had worked in marketing and management for 7 years and decided to take a three-year break to travel and work in Latin America and Europe. After a break up from a long relationship, I started questioning how I wanted to dedicate my life from then forward to make it more meaningful for both me and others. At the age of 21, I started working in a company as a product manager, developing a portfolio of home products with Chinese and Indian suppliers. This prepared me to identify markets trends, opportunities for new product portfolios, to negotiate demanding contracts, and to develop a brand from scratch. In those years, import-export was anything but sustainable, and I kept constantly asking about our “ethical” approach. My life changed when I discovered the concept of Social Business in a book. The idea of a company being driven by change captivated me. I didn’t know I was an entrepreneur at that time, but I was moved by my beliefs. So, in 2011, I decided to combine two of my passions: travel and social impact. Later, I realized that what we were doing was called responsible tourism. So I joined the MSc in Responsible Tourism in Leeds (UK), where I’m currently a student, actively researching and learning more. It has opened a new door for both me and Open Eyes. Answering your question now made me realize it was the concept of social enterprises that got me into sustainable tourism! In 2011, you founded the Open Eyes Project in India. Why? And how does this social enterprise approach sustainable tourism? It may sound overconfident (which I was not!) but it was a vision. I wanted to “open the eyes” of people to positive initiatives occurring through travel. I chose India because of a feeling as well, a feeling of responsibility. Sometimes I think that Open Eyes chose me, and not the other way around. Our first move was to put our ethical values at the core of the business, as any social business should. After joining the MSc, I began running the company more holistically. I learned how to measure impact that considered social and gender issues in tourism and international development, how to develop new ways to include communities into the guest experience, and to create pro-poor, immersive travel experiences I would never have thought of before. Now our approach is more ambitious. Firstly, we work to investigate and identify the needs of communities and guests for responsible trip implementation. Our most recent offer, a “Wellness Retreat” which employs blind women as massage therapists, has taken two years to develop and is a good example of Open Eyes’ commitment to communities, due to the complexity of our research and our limited resources. Secondly, our focus is to work on inclusive tourism for women, and more recently the visually impaired. Thirdly, we believe that, to make a change within tourism, we must work in the areas where conventional trips happen and substitute them with responsible tours, such as our “The Mindful Triangle of India” tour instead of the classic Golden Triangle trip. What motivates you to help create socially responsible tourism experiences in India? Could you share your vision with us? India itself is so intense that it motivates me through its challenges and opportunities. It is so diverse and vast that we can always see new opportunities to develop responsible tours. The challenge here is to be focused, and to find the right partnerships. At Open Eyes we are driven by a new vision after an emotional encounter with a blind woman. She was lost in Delhi, surrounded by hundreds of people who were ignoring her – she was invisible to them. I saw her, took her to her destination, learned from her, and ultimately realized that Open Eyes could help solve a major injustice. From then, I decided to make Open Eyes’ vision “to create powerful heart-warming and soul-healing connections between vulnerable women of all continents”. We currently have two international students interning in our Delhi-based office to support our research and implementation for our retreats employing blind women therapists, in partnership with the National Association for the Blind (NAB). Despite NAB’s on-going efforts to train blind women to practice reflexology or medical massages, many of the women end up unemployed. We have designed a holistic retreat with five wellness elements: nature, food, touch, movement and connection. We are focused on implementing five new retreats and employ 10 blind women in 2018. Within five years, we expect to grow organically to increase the number of women we will train in tourism and hire. This retreat made sense for Open Eyes for two reasons: first, 72% of our clients are female and have asked for packages to help them make deep and long-lasting experiences (our wellness tours sales also increased by 30% last year); second, we identified that there are 15 million blinds in India, of which 48% are women and only 23% are financially independent. We will raise this bar. In your view, which are the main tourism sustainability challenges that India faces today, especially linked to the often-touted potential of tourism to provide opportunities for women and disadvantaged communities? Overpopulation is a major issue to tackle in India. In a country with 1.2 billion people and poor air quality, access to drinking water and proper sanitation, big differences between layers of society, and the fast growth medium class following the European ‘model of consumerism”, make it unsustainable in every way. In tourism, what I have realized is that the major challenge to more inclusive tourism for women and disadvantaged communities is the lack of access to the mainstream tourism market and the absence of good training programs (mainly in North region). At the Open Eyes Project, we have experienced that most of the time communities in India have a beautiful and skilled ability to make a living though tourism; however, they just need the bridge to connect to the tourism industry. This has been Open Eyes’ mission since 2011: identify the skill set that tourism stakeholders usually exclude from the conventional holiday experience. We train them and create immersive experiences, which connect them to travelers in both an urban and a rural setting. We have addressed these issues through marketing strategies and a vocational tourism training program, which has served 59 underprivileged youth since 2014 (started with 10 in year 1) and resulted in 37 concrete work placements. This course is fully sponsored and provided by Open Eyes. This year we have implemented day training for 29 visually impaired women. We are working to make it a two-month course and adapt it to their needs, such as providing information regarding hospitality practices. 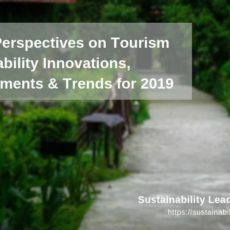 Do you have good practice examples of destinations which have found ways to implement sustainability criteria in their tourism management strategies? I have always found the Costa Rica Certificate for Sustainable Tourism (CST) a good example of implementing destination management strategies. 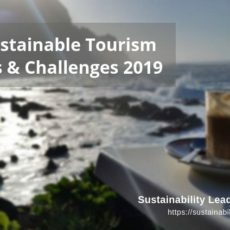 The CST involves criteria and strategies for all tourism companies to approach a sustainable model, in terms of decreasing their impact within their operations. It is a genuine certification made from the country for the country. Most of the hoteliers are proud of it and hence, travelers look for accommodation with this certification before booking. The list of those certified includes almost 300 hoteliers, 100 tour operators, and 100 other tourism related companies. The CST addresses physical-biological parameters, infrastructure services, guest awareness and socio–economic environment which it makes it a good model to replicate for other Latin-American destinations. In the state of Kerala, in India, I have been impressed by its destination management strategies from a very holistic partnership point of view. Their strategies to develop responsible tourism practices involve academics, tourism companies, entrepreneurs, communities and institutions. This is noteworthy, and I think that other states can learn from the destination management strategies used by Kerala. I wish more states in the country would have the same willingness and vision to implement sustainable practices at their destinations. 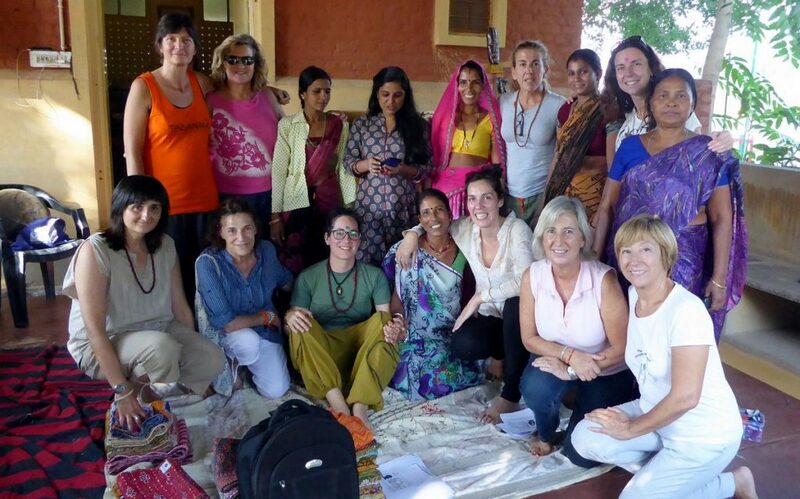 As a female entrepreneur in India, which 3 aspects of starting, running and growing a responsible tourism business do you find the most difficult? I think the most difficult aspect of being a female entrepreneur in India has been finding the space and the confidence to discover my strength, in a country where the tourism industry is almost 90% managed by men. Running and growing Open Eyes as a female in India, is emotionally, physically and energetically challenging. Every stage has been, and still is, equally difficult for me. Because I started with no financial support, I remember at the starting point of Open Eyes I needed such energy and commitment that I almost forgot my own needs. However, the phase of finding partners (some are work and life companions), communities, and designing the tours was magical and made it worth the difficult journey. The most difficult aspect at this stage? I’m still learning how to manage the team, of which I’m very proud, using a bottom-up management approach. I want Open Eyes to be a space for growth development. Not just for our communities, but for our team members, so they can reach their maximum potential as human beings within the company. I know what that means and want them to experience the same. What 3 achievements of the Open Eyes Project are you most proud of so far? Opening our new office in New Delhi last year, after six years of operating as a Spanish-registered social enterprise, meant a lot to me. It means that we are scaling organically and it has given me more confidence to keep working in this direction. This step has helped us to be long-listed for the Responsible Tourism Awards organized by World Travel Market (WTM) and Outlook Traveller Magazine in India in January 2017. We were selected in the ‘Best Cultural Immersion’ category for our “Magicians and Artists tour”, designed with artists settled in the slums areas of North. As a foreign-born entrepreneur and founder, up against over one hundred locally-owned companies, this was a very emotional moment. However, our latest but proudest achievement is our final “Wellness retreat package”. It has taken us two years to research and implement, and it leads Open Eyes to another level. We are moving to address the exclusion and lack of opportunities for blind and visually impaired women in India, and the lack of integrity of current wellness tours in India. Reflecting on your own experience, what 3 bits of advice would you give to women keen to start their own responsible tourism business? Listen to your heart. It is the best way to make decisions when your rationale and your mind conflicts, and follow your intuition. Build an environment of wise people around you. If possible, connect and bond with women like you anywhere you go. You will need moments to be listened to and held. As [easyazon_link keywords=”Jane Goodall” locale=”US” tag=”slpus-20″]Jane Goodall[/easyazon_link] says, “What you do makes a difference, and what you must decide is what kind of difference you want to make”. So enjoy the journey and make the best of it! Connect with Anna Alaman on LinkedIn. 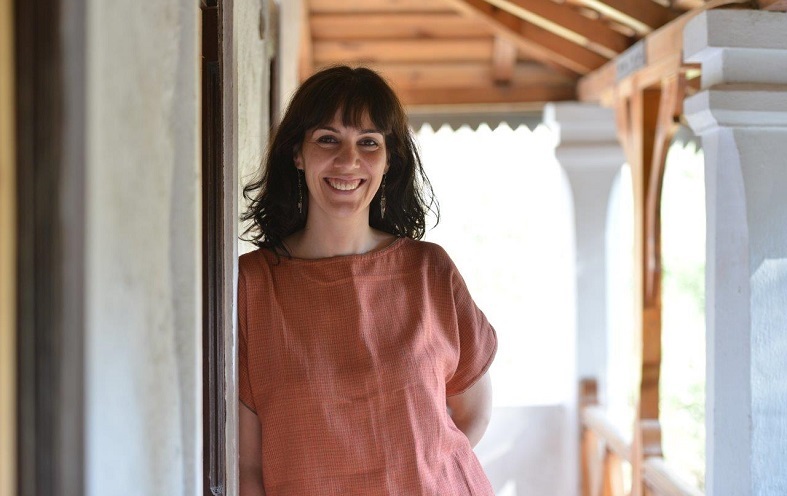 Enjoyed our interview with Anna Alaman on how the Open Eyes project creates employment for blind and visually impaired women in India through offering responsible tourism and authentic travel experiences? Spread the word!